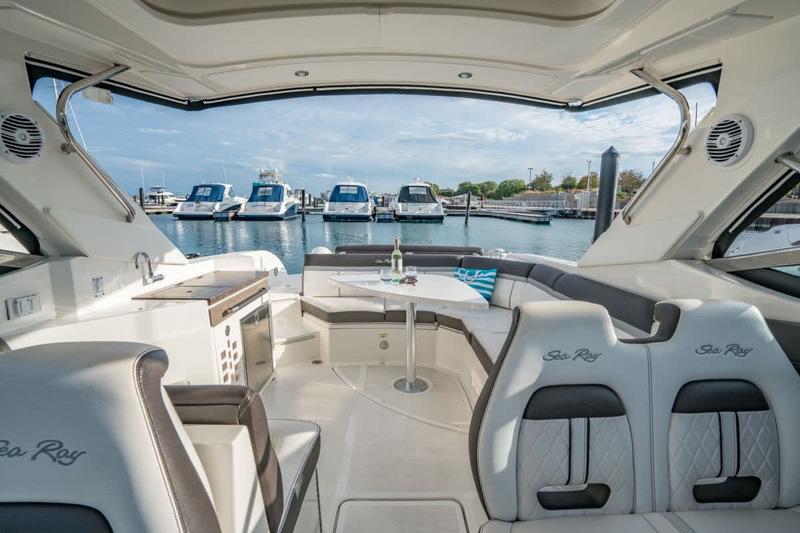 The Sea Ray SLX 350 is a phenomenal yacht designed principally for day excursions and entertaining. 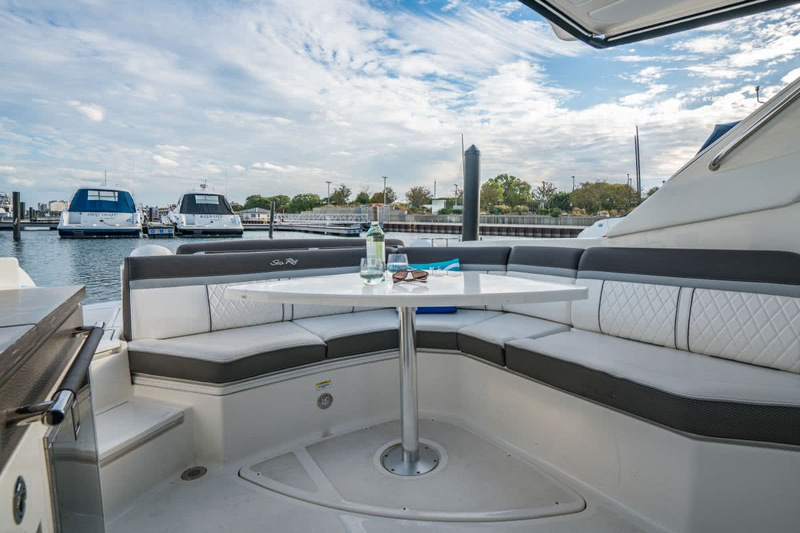 At 35 feet in length overall, with a 10.5-foot beam, and displacing 13,000 pounds, this is a sizable, stable yacht. 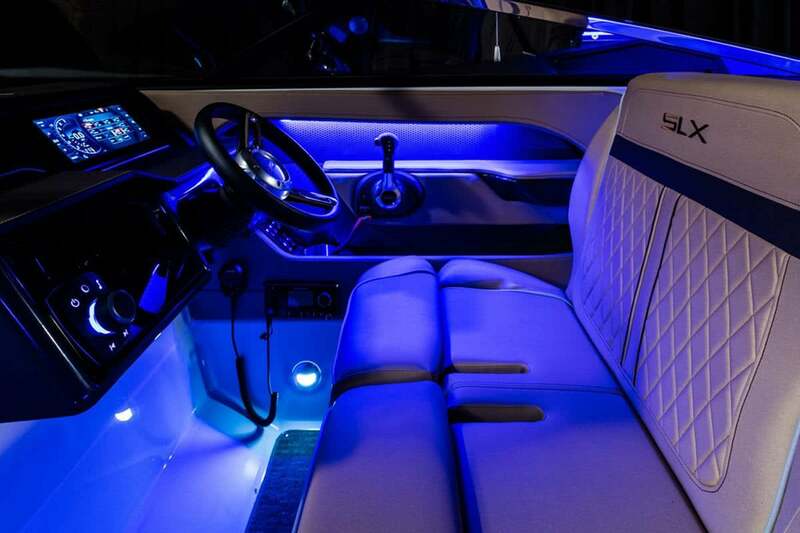 The Pinnacle Edition of the SLX 350 sports a solid black hull, two-tone charcoal-grey and white cockpit materials, and cool blue led lighting. She is absolutely stunning. Our boats feature a state-of-the-art glass touch screen at the helm which controls essentially every system of the yacht. 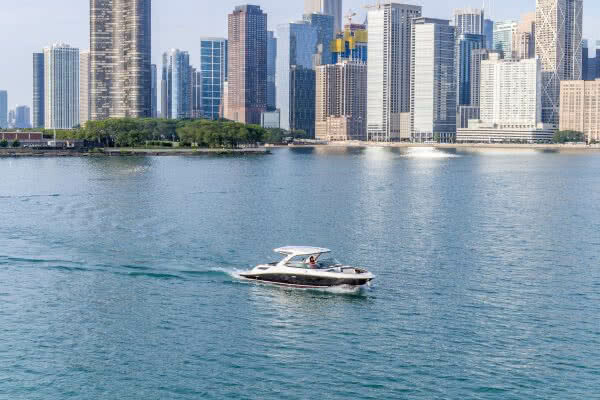 The Pinnacle Edition is further equipped with the Axius drive system that allows the boat to be moved in all directions while docking with the touch of a joy stick. 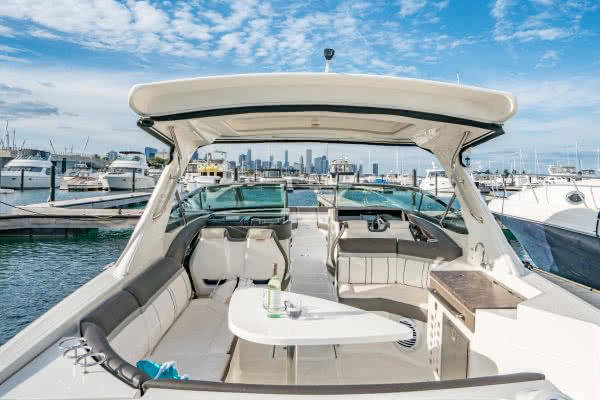 The Sea Ray SLX 350 is a spacious, elegant, open-bow boat, with seating forward, and comfortable aft-facing lounge seating on the transom to enjoy while at anchor. Ample seating in the middle of the boat, along with forward seats that swivel backward, make the boat a great platform for entertaining your group of up to ten. Below there is a small head and gear storage. 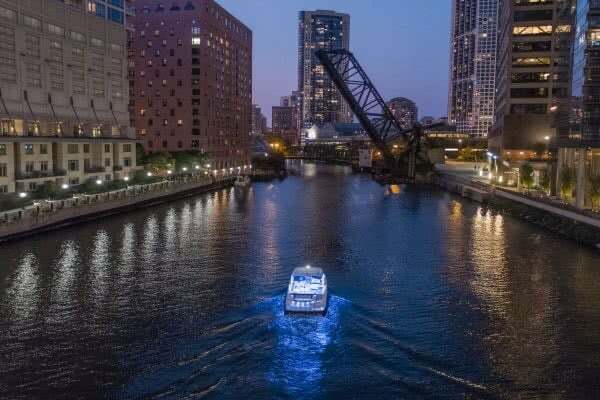 There are no cooking or overnight accommodations on the boat. The yacht has a sleek hard top over much of her cockpit providing great protection from the sun overhead. 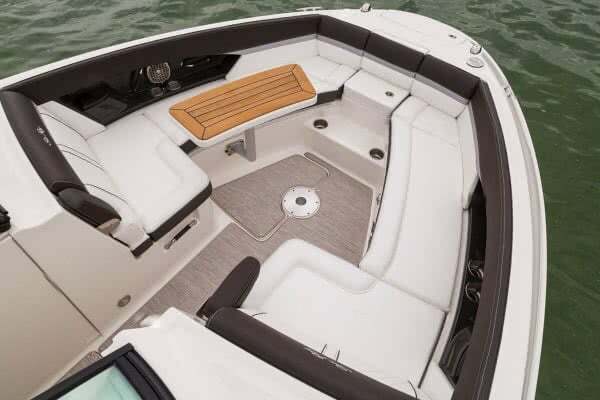 There is no canvas windshield or soft windows to contended with – only a simple cockpit cover to protect the boat when not in use. 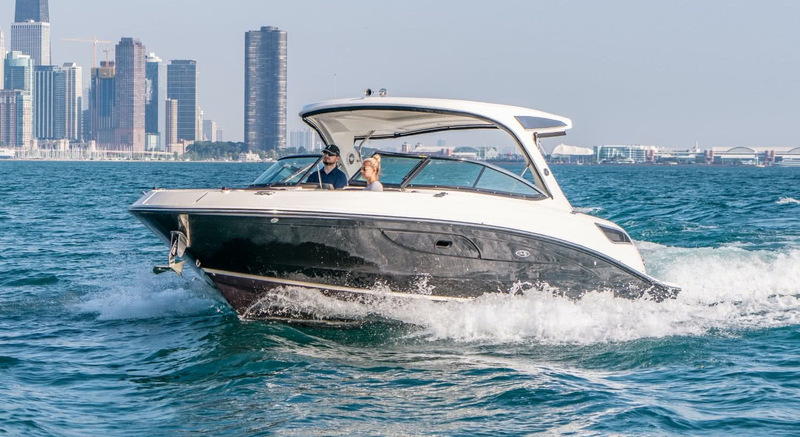 The absence of canvas gives the boat a fantastic open feel on clear days, but offers far less protection in heavy weather – so she is a fair-weather boat. Twin high-performance, inboard engines deliver 600 horsepower to her I/O drives allowing the SLX to achieve 25 knots effortlessly. 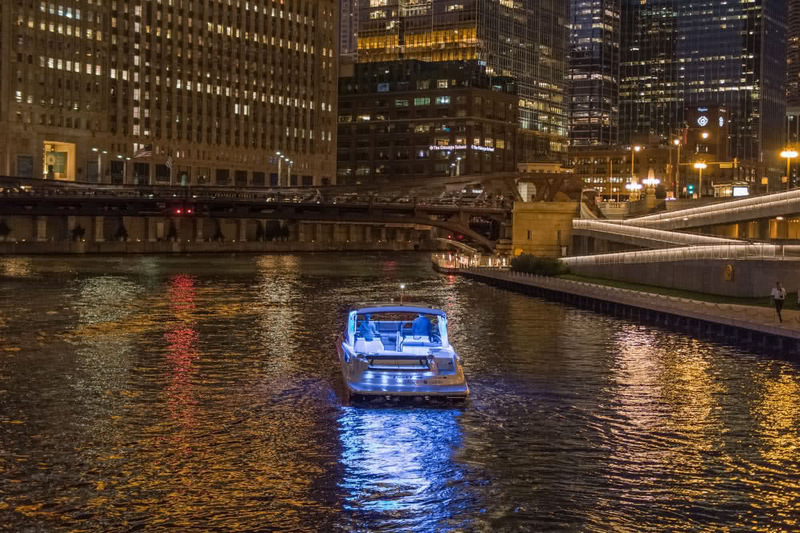 The boat is incredibly fast, yet remarkably stable. Sea Ray’s reputation for superior engineering is obvious when in command of this fine machine.